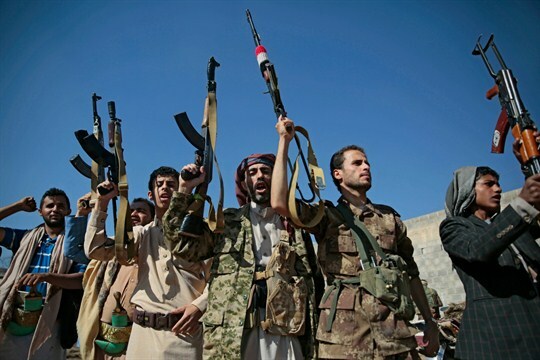 Men loyal to Houthi rebels hold up their weapons as they attend a gathering to show their support for peace talks held in Sweden, Sanaa, Yemen, Dec. 13, 2018 (AP photo by Hani Mohammed). Given the level of regional tensions, it is no surprise that Secretary of State Mike Pompeo’s recently concluded trip to the Middle East came with a busy itinerary. Amid questions about the abruptly announced U.S. pullout from Syria, an American response to the killing of Saudi journalist Jamal al-Khashoggi, the potential of brokering a resolution to the stalemated rift in the Gulf between Qatar and its neighbors, and the Trump administration’s hard-line stance against Iran, an often overshadowed policy dilemma has shifted toward center stage: the war in Yemen.